When I need to take a few minutes away from work, I’ll jump online for a couple of games of blitz chess (five minutes to make all moves) or play backgammon against my computer. I’ve also started doing logic problems, the kind of puzzle with grids and clues such as “The orange item took 10 minutes less to print than the yellow item.” I’m not great at them, but they do provide some distraction and, as a nerd, I’m happy when I figure one out. I’m working through the Puzzle Baron series (currently on Book 3) and have noted some of the conventions the editor follows. One of those conventions is that the puzzle’s parameters, such as the color of an object, country, or date can’t provide a contextual clue to the correct answer. As an example, you wouldn’t have a guy named Richmond who turned out to be from Virginia because Richmond is the capitol of Virginia. When the editor changes a clue to avoid contextual clashes, it can lead to some interesting discontinuities that provide a hint to the correct answer for a clue pair. In this instance, puzzle #7 in Puzzle Baron’s Logic Puzzles: Volume 3 contains just such an edit. The puzzle asks the solver to correctly assign the birthday, name, country of origin, and profession for a set of five passport applicants. The countries are Canada, France, Norway, South Africa, and Sweden, while the birthdays fall on April 13, May 18, June 14, July 16, and August 15. It’s conventional for the days and months to occur in sequence so you can give clues such as “The applicant from Norway was born one month earlier than the applicant from Sweden.” Days are often sequentially numbered as well, but in this case the months were used as levers and the days were not, so the day numbers could be changed if desired. The oddity that made me say “That’s funny…” is the May 18 date. The other four day numbers are in sequence from 13 to 16, which makes the May 18 date stand out. I have a number of Norwegian friends, so I happen to know that May 17 is Norwegian National Day. Based on that knowledge, I assumed that the applicant from Norway would have the May 18 birthday because, if it had fallen on May 17, there would be external context to guide the solver to the correct answer. Sure enough, that’s how the puzzle worked out. If the editor changed the date rather than the name of the country to leave an Easter egg for solvers, it’s an excellent gesture that in no way detracted from the fun I had solving the puzzle. If the change was unintentional, it’s a reminder of how seemingly irrelevant changes can make a big difference. It could have been a total accident, of course, but it’s still a cool story. Kristian Hammond, a professor of computer science at Northwestern University, wrote a guest article for MIT Technology Review that offered his perspective on how the spectacular public failure of Microsoft’s Tay chatbot could have been avoided. Hammond brings up some good points, but I believe his analysis is incomplete. Many of you have probably heard about Tay, the youthful-seeming chatbot Microsoft released into the wilds of Twitter. Within a very short time, malicious users took advantage of the bot’s learning algorithms and caused it to create homophobic, racist, and anti-Semitic tweets. In a press release, Microsoft noted that they hadn’t had a problem when they tested a version of Tay in China, but I argue the team should have suspected the cadre of trolls on Twitter would take shots at the bot and try to make it produce offensive tweets. At the very least, the team should have built in a list of banned terms rather than use a strictly naive learning procedure. Hammond, who is both a computer scientist and improv comedian, argues that using a combination of techniques inspired by Marvin Minsky and improv comedy could have helped avoid the worst effects of malicious targeting. I agree, and believe his notes assessing the difficulty of the AI problem Microsoft tackled are spot on. I do have some significant disagreements with his suggestions for how using improv techniques, specifically regarding show management, would help. Improv comedy groups, which rely on audience suggestions to make the show run, must determine how much control they want to grant the audience. Some groups are open to any and all suggestions, regardless of how offensive, and build the best scene they can given the subject matter. Other groups control their subject matter more closely. The trick is finding the right balance to do a show you’re comfortable with and that will attract an audience. But beyond attracting an audience, you must attract the audience you want. Nothing neutralizes a bully as well as being called out. My guess is that if Tay pointed out that it knew it was being played in one-on-one interactions and provided attribution for newly learned “facts” when using them in public tweets, the shaming effect would have been enough to shut down even the nastiest attacks. I believe Hammond is just plain wrong on this point. As Whitney Phillips, now a professor at Penfield College of Mercer University, discussed at length in her book This is Why We Can’t Have Nice Things, Internet anonymity shields trolls from the consequences of their actions. Trolls do what they do for lulz, laughs at someone else’s expense, and either don’t care or get lulz when their unattributed Twitter posts provoke someone enough to warrant a counterattack. Alcohol provides a similar shield for audience members watching improv shows in bars. The bar makes money off drinks…entertainers are just there to attract audiences and help maintain a steady flow of orders. Many talented performers, whether improv comedians or musicians, have lost gigs because they couldn’t get enough friends to show up and spend money each week. I also disagree with Hammond’s depiction of the consequences for a drunk twenty-something audience member who “scream[s] out obscene suggestions that she will regret for the next two years”. First: been there, feel your pain. Second: she probably won’t regret what she said because she won’t remember what she said. For individuals such as her (or him), this incident is just one of many similar nights on the town. You just happened to be there when it went down. The team behind Tay failed to accurately assess the environment into which they released their bot. That said, Microsoft can move forward by using another time-honored improv technique: the Failure Bow. When a scene, song, or on-the-spot pun goes poorly, the performer steps downstage center, faces the audience, says “I failed. Thank you.” and bows. Acknowledging the moment helps everyone move on, most of all the person who failed. I don’t get angry at online writers, or headline writers, that often, but a tweet from Wired regarding the go match between AlphaGo, the computing engine built by the DeepMind section of the company formerly known as Google, and world champion Lee Sedol, pushed my buttons. No, he didn’t. Not because Lee couldn’t regain his pride after having no hope of winning the five-game series, but because he never lost it. Lee admitted to playing a loose opening in Game 1, but based on the AlphaGo games he’d seen from previous matches, he didn’t think the program was strong enough to take advantage of the situation. It was. At no time, the world champion said, did he think he was ahead. In Games 2 and 3 he played better moves, but AlphaGo still forced resignation. Part of the problem was that AlphaGo didn’t use as much of its allotted two hours for early moves as Lee did, so the computer was way ahead on the clock for most of the game. Early moves create the framework for the rest of the game, so players must weigh them carefully. Lee was clearly frustrated by his inability to win any games in the first part of the match, but he came into Game 4 ready for the struggle and played a surprising, powerful move in the middle of the board after not getting much out of the opening. Expert commentator Michael Redmond, a 9-dan professional player (the highest rank awarded), said he didn’t see Lee’s wedge move coming, but as the game progressed he realized its power. Despite running very low on time, Lee was able to maintain his momentum and take advantage of aimless play by AlphaGo to secure the win. The Wired story should have centered on the theme of a human player beating a go engine for what might be the last time. The best computer chess programs are favored to beat even world champion Magnus Carlsen in 99.9% of their games. AlphaGo’s improvement over the past five months, when it played well enough to win 5-0 against a professional rated in the top 650 players in the world but made clear errors, is astonishing. AlphaGo trains its neural nets by playing against itself at high speed, earning decades of play experience in months. I don’t doubt it will be unbeatable by humans in a very short time. Lee stepped up under extremely difficult and very public circumstances to secure a brilliant win. The advances in machine learning behind AlphaGo’s abilities in a game thought to be too complex for computers to manage are notable, but Lee Sedol’s play and fighting spirit are the real story. When I think of what it means to “be a beginner” at something, I think of learning a new language or trying a new sport. I didn’t expect to rediscover the joys and struggles of being a beginner as a writer. I had just finished Microsoft Excel 2016 Step by Step for Microsoft Press, my sixth Excel Step by Step book, when the publisher approached me to take on Microsoft OneNote Step by Step. I looked at my schedule, swallowed hard, and agreed to do it. I’d worked a bit with OneNote as part of my Office Online Essential Training course for lynda.com, so, while I wasn’t an expert, I wasn’t coming in completely cold. Besides, I’m a writer and course developer—my job is to tease out a program’s intricacies and make them clear to the reader or viewer. How hard could it be? I’ll pause until you stop laughing. You can write a book about anything if you do enough research, develop a few ideas of your own, and quote liberally from other sources. I just read a business book, Everything Connects, that did exactly that. The main author probably wrote a great proposal based on his experiences as a serial entrepreneur and meditation practitioner, took his advance, and wrote down everything he could about those subjects. My guess is that he produced about 150 pages for a planned 250-page book, so the publisher brought in (or had already hired) a professional writer as co-author. I also turned to the supporting literature on OneNote for guidance, but there’s not a lot out there compared to the vast, rich resources on Excel. That said, I wrote what I could and discovered a lot as I went along, but I didn’t have an experienced user’s feel for the program. I’m fortunate Microsoft convinced Ed Price, formerly a member of the OneNote product team, to be the book’s technical editor. Ed knows the software in depth, both as a user and someone familiar with the broader customer base’s needs and desires. He added a lot of material I’d considered not important enough to include, changed the emphasis of certain sections of the book to improve its usefulness, and became, in all but name, a full co-author. I’m grateful for the substantial help Ed provided and hope to make him a full co-author, with cover credit, when it comes time to refresh the book. As a writer it was good, though incredibly frustrating, to write about a program I hadn’t worked with extensively. I had 20 years of skill and discipline to power through a first draft we could use as a basis for critique, but I had several flashbacks to when I was just starting out and lacked the tools I have now. I survived (with the help of Ed and others), the book will provide good value to OneNote users, and I was reminded how difficult a thing it is to produce a manuscript from whole cloth. I’m glad I agreed to help out, but I’m sure glad we’re done. The last of the three STDP2 presentations I’ll review was by Randall Munroe, creator of the online comic xkcd. I’ve read xkcd for years and am constantly amazed at the quality of his work. Munroe started out by noting that it’s ridiculously easy to get in your own way by trying to automate a process that can be done perfectly well by hand. 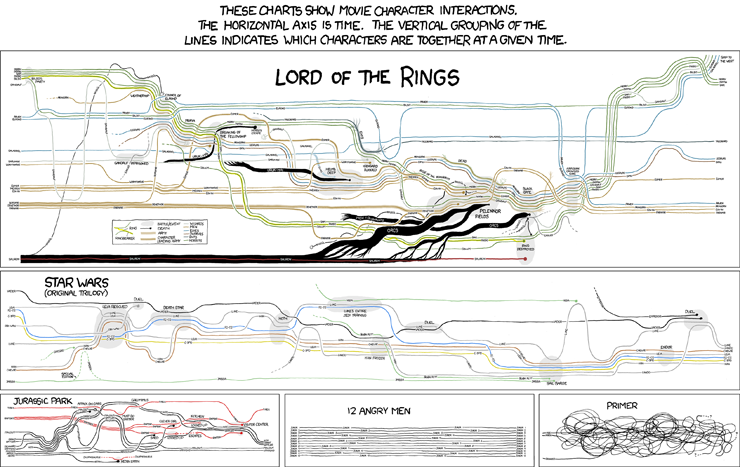 As an example, consider a chart showing character interactions in the Star Wars or Lord of the Rings movies. Munroe said that he tried for ten years, off and on, to develop a tool that could translate a script into a character interaction timeline. Finally, frustrated, he drew the graph for the original Star Wars trilogy by hand in an hour. I imagine the timeline for 12 Angry Men took slightly less time to complete. Displaying data is easy, Munroe argued, but determining which data to show is tough. That said, some presentation modes are better than others. Once he finds an angle he likes, he looks for other ways he can leverage that approach. Recently, he published a graphic on California droughts that uses the physical shape of the state as its axes. I’d love to see this design metaphor used in other graphics. He makes his infographics more palatable by adding humor, such as asides about a specific data point or a joke to indicate that, while he takes the analysis seriously, he doesn’t take himself too seriously. That approach lets him reveal that the Environmental Protection Agency assigns a human life an economic value of $8.2 million when performing cost-benefit analysis without inciting his readers. Munroe came across as a soft-spoken, gentle person who is still slightly uncomfortable speaking in public. That said, his resolve strengthened when he discussed his wife’s cancer diagnosis and how he communicated the realities of treatment and survival rates. The image that resulted, “Lanes”, is one of the most powerful infographics I’ve encountered. He didn’t want to leave us on such a somber note, so he concluded by showing us a graphic called “Lakes and Oceans” that he thought was interesting but nothing special. 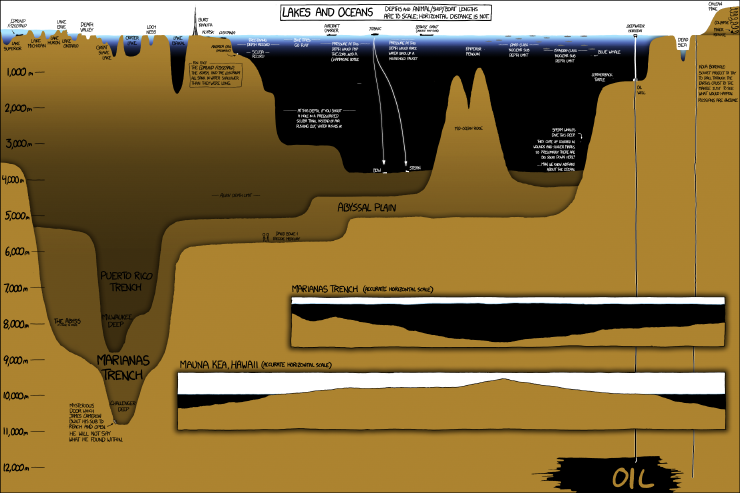 It shows the relative depths of various bodies of water and the ocean floor. He was surprised to discover it was one of the most popular things he published that year. I enjoyed my time in Seattle. The presentations by Jonathan Corum, Maria Popova, and Randall Munroe gave me a burst of energy that have let me approach my own work from a fresh perspective. Maria Popova has produced Brain Pickings since October 23, 2006. What started out as an occasional email newsletter sent to coworkers at one of the four jobs she was working to pay for college has turned into a popular and well-regarded net resource. Her presentation was substantially different from Jonathan Corum’s. Corum concentrated on his visual design process, but Popova focused on what she calls combinatorial thinking. Her goal is to combine lots of information with a little wisdom to produce an interesting and useful intellectual product that helps readers live reflectively. Allow yourself the uncomfortable luxury of changing your mind. Do nothing out of guilt, or for prestige, status, money or approval alone. Be generous with your time and your resources and with giving credit and, especially, with your words. Build pockets of stillness into your life. Maya Angelou famously said, “When people tell you who they are, believe them”. But even more importantly, when people try to tell you who you are, don’t believe them. Popova went into points six and the seven in a bit more detail, offering quotes from Mary Oliver, Tchaikovsky, Chuck Close, and Isabel Allende to support her points. She also shared a link to an interesting visualization summarizing the sleep habits of successful writers. Though the data was necessarily a bit piecemeal and anecdotal, it appears that late risers, meaning those who typically awake around 10 AM or 11 AM, tend to produce more work but win fewer awards. For someone like me, who is firmly in the late riser camp, the good news is that there is no secret hour of awakening that means you will win a Pulitzer Prize. She also noted that, in many ways, our work ethic fights us. American culture measures us by what we achieve and, while just showing up is important to success in life, she feels we can let ourselves fall into a routine of meaningless productivity without truly living. Popova’s presentation was substantially different from Corum’s and, at first, I was a little put off by the lack of compelling visuals like those presented by a member of the New York Times media team. Once I realized that her focus was more on internal processes as opposed to audience-focused visualizations, I was able to appreciate her points and ended up getting quite a lot out of her presentation. She also landed me as a new supporter of Brain Pickings, earning her the price of a cup of tea each month. Chess is a rewarding but maddening game. You can build up an overwhelming position for the first 40 moves and then make a simple tactical error that lets your opponent back into the game or, in extreme and highly embarrassing cases, even win on the next move. Interviewer: So, tell me…does throwing away a win hurt? Curt: Yes. Yes it does. You see golfers going crazy over their rounds, alternating between self-loathing over the short putts they missed and self-praise for the 150-yard shot that ended up a foot from the hole. I played golf occasionally for a few years and can testify to that effect. Some of my friends play 18 holes just so they can feel the satisfaction of hitting one good shot. Some days they have to play 36 holes. A golfer having a bad day still gets in some physical exercise. What about chess players? As with many endeavors, it depends on why you’re playing in the first place. You always get to exercise your brain and look over the consequences of your moves, which keeps you sharp and might fight off the effects of aging, but what else? If you’re playing with someone who’s about your own strength, you get the benefit of an equal competition and, very likely, enough wins to keep things interesting. Playing someone stronger than you helps you learn and winning every so often helps keep you going. Playing a weaker player lets you win more often and teach the game, even if only indirectly. What’s often overlooked is that chess can be a social game. If you play blitz chess, where players have to make all of their moves within three or five minutes, you can get in a lot of games and try many different types of positions. Playing a longer game lets you think more deeply, and playing without a clock lets you approach the game more casually. You can also take time to analyze your game with your opponent. Serious players often try to identify the move where the winner got an advantage and what the loser missed. When done with a spirit of exploration and sharing, post-game analysis can be fun and helpful.